This one has always been mighty peculiar. Super Bomberman, the original Bomberman title for the Super Famicom, saw a lot of changes when it was brought over to the Super Nintendo in the west. Most of these were favourable or generally understandable. 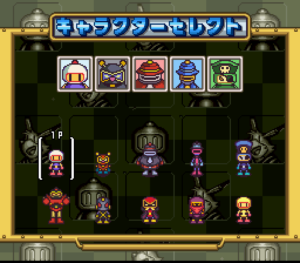 The palettes for the Mecha Bombers faced in stage 5 were originally off-colour, perhaps to indicate that they were “fakes”, but were changed to the colour palettes of the corresponding “normal” Bombermen. 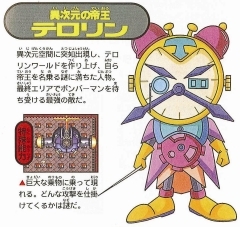 Likewise, the colours on the big victory screen Bombermen, which were originally all kinds of crazy strange and even had yellow skin, were “corrected”, and the mole-like Moguchan enemy that first appears in stage 3 was drastically altered to avoid claims of racism in the west. However, one change just doesn’t make a bit of sense to me, and that is the removal of the introduction cinematic from the game. In the Japanese release, if the player waits on the title screen, a very simplistic movie reel effect plays out and still images illustrating the game’s story slowly roll up. There is no text to translate, nothing. It could have easily been kept in place. However, for reasons only the localization team, cobbled together some twenty years ago, can know, it was disabled. And that’s the key word here – it was disabled. It’s not like they encountered some strange issue that required them to cut the intro to gain space back in the ROM. The intro still exists in all international releases of Super Bomberman, and can even be triggered using the Pro Action Replay code 7E00A433. So… for what possible reason did the localization team find to disable it? We may never know. In the Battle Game character selection screen of Super Bomberman 5, the player is presented with 9 options and… a red X. Never before had an unlockable character appeared in the history of the Bomberman franchise. This was uncharted territory! So who could it be? Subordinate Bomber, who is conspicuously missing from the lineup? Or Terrorin, the game’s strange new antagonist? Nope. In the biggest troll of the series at that point, completing the Normal Game at 100% would unlock… Gold Bomber. Literally, it is a palette swap of the normal Bomberman, replacing his head and body colours with yellow (it doesn’t even look like gold). …And the truth was endlessly disappointing. But that wasn’t always the case! By loading a special password into the Configure Battle Mode, or by utilizing the less restrictive/dangerous Pro Action Replay codes I conjured up some years ago, you can actually access Subordinate Bomber as a playable character, and he is… surprisingly complete. Placing him into play will cause some wild graphical glitches in the Battle Game, but his sprite sheet is complete, including an idle animation, victory animation, Rui-riding sprites, and even a revenge ship, none of which are seen during normal gameplay due to his exclusion in the final release. The only things apparently missing are his scoreboard and character selection mugshots, and the voice clip announcing him as the victor. If you use him in the Normal Game, he doesn’t even cause any graphical glitches. From top to bottom: White Bomberman, white Subordinate Bomber, and white Gary Bomber. Subordinate Bomber was originally included as a playable character, because he is a distinct Bomberman, like the others. However, due to the map-branching nature of the Normal Game, because it is not necessary to clear every area in order to achieve the good ending of the game, the developers wanted to throw in a special reward for players who went the extra mile and cleared the game 100%. To do so, they decided to lock one character and open it up when this achievement was met. Now, it would be strange to lock one of the 8 Fiendish Bombers, because it would imply that one is somehow more important than the rest, and the identity of the locked character would be obvious to players. However, as their name implies, there are only eight Fiendish Bombers. Subordinate is not a Fiendish Bomber; he is merely Pirate Bomber’s lackey (seriously, even Baron Bombano’s dog outclasses him). But locking Subordinate Bomber and granting him as a special reward may have felt odd, considering that he is not even a real member of the villains, and so he may be regarded as an inferior character to the rest. So, removing Subordinate Bomber from the equation entirely would allow the developers to free up an extra character slot and put someone else in who could serve as a real reward. Terrorin, unfortunately, would have never been more than a mere brainstorming suggestion. As is evident in the way he is programmed into the game, he was never intended to be playable. He lacks any animations other than the ones used in his boss battle (I have checked to the best of my ability). He is less animated than the Bombermen in the game, and generally feels more like a unique opponent. His bizarre death animation pretty much seals the deal, as he would have needed an animation more in line with the other characters to maintain stylistic consistency. Does it bother anyone else that his sprites look almost nothing like his artwork? That’s all for this article. Thanks for reading! If you’re interested in more Bomberman-related stuff, you can check out my other articles on the subject in general. I talk about a lot of things, from cultural influences to bosses to old, obscure toys. h/t: Duke Serkol for bringing up the Bomberman 64 door all those years ago, Dragon Bomber for scanning the Super Bomberman 5 manual and Ragey for ripping the Super Bomberman cutscene still, both of which were used in the header image for this article (and for the Terrorin image).